Like any long-married couple, they didn’t openly discuss their infatuations. They weren’t in the market, but more than that, the timing was really poor. “We’d just had a death in the family and we were not thinking of moving at all,” Paula says. “But both of us, without talking to each other, kept thinking about this house.” The standoff lasted 10 days, whereupon they made a lowball offer that was accepted and the stone began to roll downhill. Downlights were added to the original cabinetry and quarter round display shelves crafted in the area where upper and lower cabinets were removed. 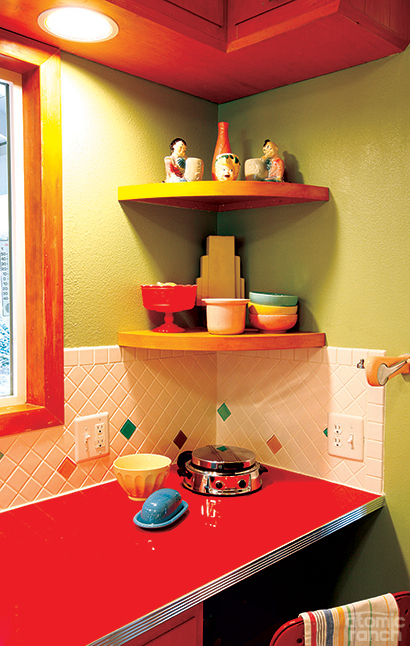 The white backsplash combines ceramic and accent glass tiles for touches of color. “You could see this was a solid house that you could do so much with,” Paula recalls, and Mark’s memory is of “hardwoods that went on forever.” The house is one of the largest in the neighborhood, a small ranch tract called Allwood Manor, where a typical home runs between 1,200 and 2,000 square feet. At 3,300 square feet, counting the large unfinished basement, they felt like kids in a candy store. 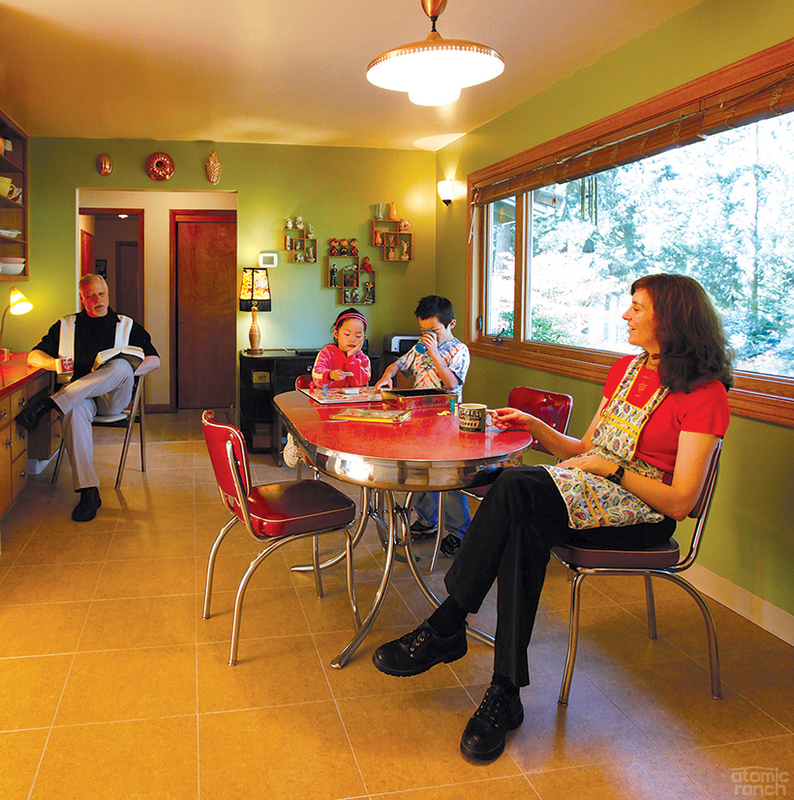 As at the previous house, they were focused on creating the retro kitchen of their dreams. A large, L-shaped room, it was blessed with original cabinetry, tons of counter space, an expansive breakfast area and a built-in desk with even more storage. The pair was less keen on the ugly vinyl floor and the brown wall oven. Paula and Mark with Alison, 7, and Kevin, 6. The pull-down copper lamp original to the house illuminates inexpensive dinette chairs from Target and a vintage table from a friend. Researching typical color schemes, the Daveys went with green, white and red, plus the warm honey color of the wood cabinetry. Red “Cracked Ice” laminate counters and metal edging were ordered through Bars & Booths, and new green pulls came from Van Dyke’s Restorers. They opted to expand the size of the window over the sink and widen the doorway to the dining room. Two upper cabinets were removed and the overhead storage compartment reframed to fit the shorter return. An electric cooktop was replaced with a reconditioned 1950 Wedgewood gas stove. Indy Construction also added downlights in the soffit area and built two display shelves for Paula’s knick-knacks. 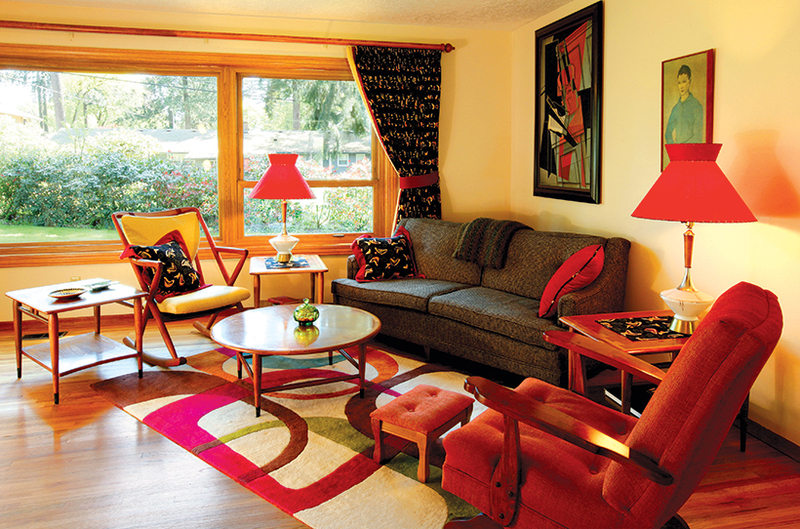 Living room furniture includes three Lane end tables as well as a Lane coffee table, all from family members. The vintage lounge chair and ottoman are newly reupholstered by Eastside Upholstery, as is the ’40s couch, while the rug is from rugstudio.com. Impressive draperies run the width of the room and required 55 yards of barkcloth. Paula Davey praises the custom shades from Moon Shine Lamp and Shade, and owner D’lana Arthur’s advice to go with red instead of a safer neutral; they dress up a pair of $20 lamps with light-up bases that Mark found at an antique store. “We saw a Jadite green Western Holly oven in Atomic Ranch, and we thought having an oven that looked like a clothes dryer was the best thing ever,” says Mark. They found a pink one on eBay for $20, which at first felt like a huge score. What with $400 to crate and ship, and adding the gas connection, it totaled about a grand. The refrigerator, the same GE model with rotating shelves that Mark had had as a bachelor, was found on craigslist for $200. 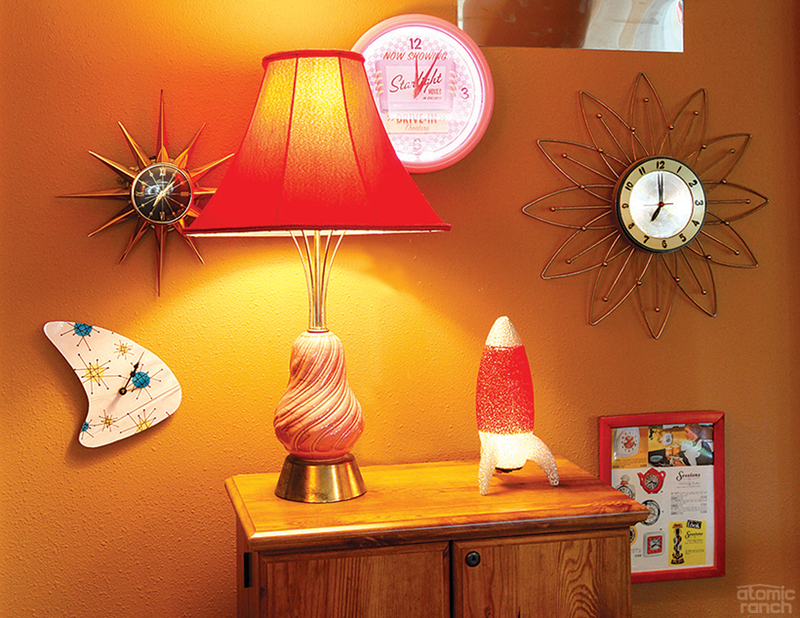 The Daveys display some of their clock, neon and advertising ephemera collections in the daylight basement, which also houses a retro bar and space for the couple’s music lessons and band practice. The couple has lots of old-time barware for their downstairs “3 Deuces” bar, and culling and actively utilizing their collections became the house rule when they moved. “My little beef is when people make their home retro again, and the house looks awesome but the kitchen is too modern, with stainless steel appliances,” Paula says.